Welcome to the website of the National Capital Chapter of the BMW Car Club of America. We are the largest group of BMW enthusiasts in the US and based in Arlington, VA. Our chapter covers Washington, DC, Northern Virginia, Eastern West Virginia and the entire state of Maryland. Live Tech Talk with Mike Miller is a question and answer session with the technical editor of Roundel magazine, and the former Bimmer magazine. After a brief introduction Mike will open the floor to questions and answers. Index cards and pens will be available for members who prefer to ask questions anonymously. Mike is happy to answer all your questions about BMWs or virtually anything else, and will remain as long as there are questions. Get ready for our biggest event of the year! Whether it's HPDE, Autocross, Performance Center hot laps, or a spirited Tour out to Summit Point, we have an entire day of multiple events planned, finishing with an end of day BBQ! Register now for Chapterfest! Registration now OPEN for all HPDE events! The best from BMW, Mercedes, and Porsche will gather at the 36th annual Deutsche Marque concours on Sunday, May 5th. Spectators are free and registration is open to those wanting to show their car. Sign up now to guarantee your spot! In accordance with Article IX AMENDMENTS of our Bylaws, we are posting this proposed change to our Chapter website. As a Chapter member, you can vote via electronic means, by U.S. Mail, or in person at the next regular Board meeting. This proposal will remain open for four calendar weeks, after which time the Board will make the necessary changes to the NCC Bylaws. Thank you for your support and timely response! The link to the vote is HERE. Lodging: We have secured a small block of Queen rooms at Berry Hill Resort in South Boston, VA. With limited vacancies in nearby Danville, Berry Hill is easily one of the nicest hotels within an hour from the race track. Please mention BMW CCA when placing reservation; queen room rate is $275/night (includes $15 resort fee, breakfast, internet, and parking). Minimum stay of 2 nights and taxes not included. Reservations within our room block will close when block becomes full or July 24, 2019, so please book your room ASAP. The National Capital Chapter is in need of a volunteer to take on its marketing responsibilities. This spokesperson interacts with some of the leading BMW-centric businesses in the area and helps promote the club and its events. 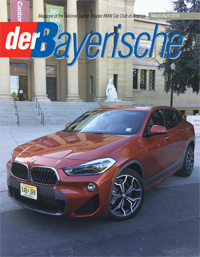 Previous marketing, sales, and/or business development experience is NOT necessary, but a strong desire to interact with sponsors, and a belief in the benefits offered by the BMW Car Club of America and the National Capital Chapter in particular are required. If this position appeals to you and you feel that you have the skills necessary to meet the position requirements, please contact Paul Seto, Paul.Seto@nccbmwcca.org immediately. We are currently looking for a volunteer to host our monthly NoVa social. Always held on the first Thursday of every month, the host is responsible for choosing and setting up locations for our meets and having fun. Hi fellow BMW lovers! We are the new co-chairs for Chapterfest 2019. Many of you have probably seen us around, at Autocross, HPDEs, Golf, Socials, Tours or Board Meetings, if not, come out to the next event and say "Hi!" We had such a blast at Chapterfest 2018 that we decided to help out with the next one. Hopefully everyone enjoyed themselves as much as we did, but if not we want to get your feedback on what didn't work this year. If you had as much fun as us, tell us! We want as much feedback as possible to make Chapterfest 2019 even better! You will find two links below, one, for those who were able to attend, and one for those who weren't. Please select the appropriate link. The surveys will only take a few minutes of your time. We really appreciate your help in making Chapterfest 2019 the best that it can be! If you did not attend Chapterfest 2018, click this link. If you attended Chapterfest 2018, click this link. We look forward to meeting you at the next event!